Find more features on Twitter, Facebook, Pinterest, Reddit and Instagram along with other media platforms. Balenciaga’s Spring Summer 2017 collection features a series of handbags inspired by bags that are part of popular culture. 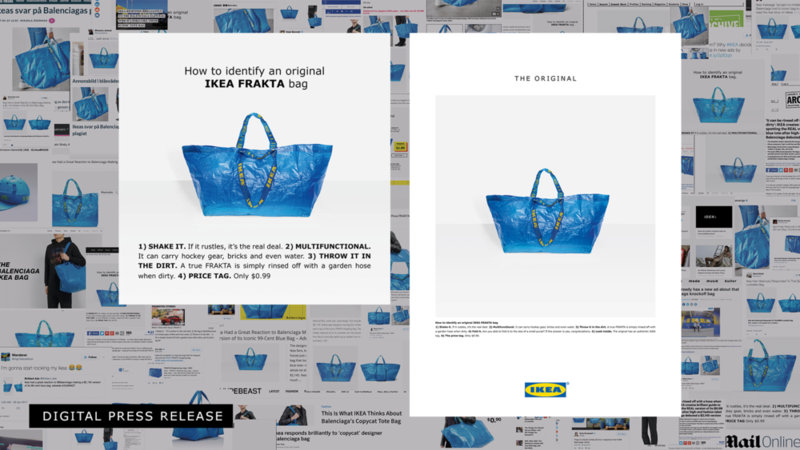 One of them, the now famous “Carry Shopper”, is remarkably similar to IKEA’s Frakta plastic bag. We decided to create an instant response and flirt back. The post highlighted the qualities of our bag and how people could distinguish it from the less original. Unique media impressions: 1.04 billion. Earned media: $10.8 million. Interactions: 1 294 235. Media budget: 0. The post was picked up by a wide range of different media: lifestyle, technology and traditional press.